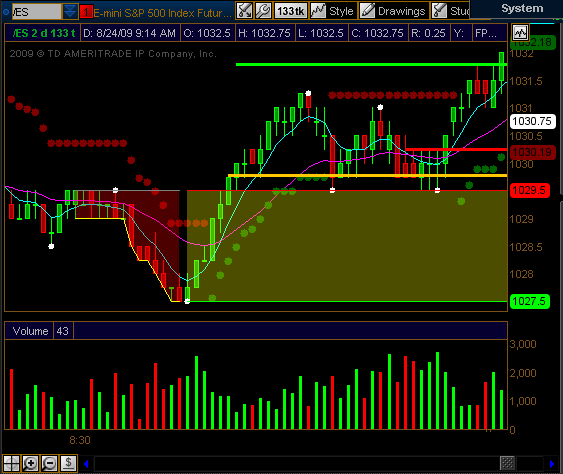 I took this trade on a break of the opening range this morning. The chart shows an indicator I’m working on, called Adaptive Opening Range. Instead of defining the OR as a specific time, it defines the OR as the first swing high and swing low after the start time (0930 ET in this case). The red cloud starts when the start time (say, the market open) is reached, and the green cloud starts once the OR has been defined by a swing up and a swing down. My idea is then to trade a breakout of that OR, in whichever direction it comes. To me, this is better than a time-based OR definition because you actually get a range based on price action. So today I went long (yellow line) on the Adaptive OR high +1 tick, stop was the OR low. I wanted 2 points on the trade (green line), but only got about 1.5 before it reversed. I eventually lowered my limit to +0.5 points and got filled (red line). Then price went on up well past my target. Again! I’m too loss-averse and I end up scratching these OR trades before they have a chance to work. That or I need to reign in my target to about a point. Once I get to enough margin to trade two contracts, I’ll sell one at a closer target (like 1 point) and hold on to the other. 3. Keep swinging if you are in good mental and emotional control, and the market environment is not adverse to it. Back to the day job grind! UPDATE 5:00 ET–I scalped 4 more times at the end of the day. I ended up grinding back down to -0.25 points, but adding the commissions in as well, I was down -0.75 points overall. I keep learning this lesson, over and over–scalping is for market makers and suckers. I’m in the latter camp today. With that, I’m reconsidering my options for trading education and mentoring, since I keep going in circles on my own. I’ll post about what I do.